The process is this. Operating at pressures of 1000 psi+ Koolfog produces micron-sized water droplets that, while evaporating and turning to vapor, remove heat from the air, cooling the surrounding area. The dry fog produced by a Koolfog system reduces outdoor temperatures by as much as 35 degrees Fahrenheit, which makes even 100+ degree days comfortable. Systems are customizable and can be expanded to fit large walkways or tailored to small rest areas. Our systems have been proven to help keep people safe and comfortable, even in extremely warm temperatures. Research has found that there is strong mall traffic in the summer as children and teenagers are out of school and young adults return home from college. Thus, it is important not to miss out on these valuable opportunities for increased revenue. The amount of money that consumers spend during each shopping trip has grown over the last few years. The number of shoppers spending $100 or more each visit has risen by 12% since 2011 according to EyeShop. Most people (81%) come to the mall with a specific plan to make a purchase, but nearly 73% end up also browsing while they’re there. If consumers find that their experience is made pleasant and comfortable with a cooling mist in outdoor areas, they will be more inclined to stay longer and end up spending more on goods and services. A large percentage of revenue in Retail centers is coming from food courts and the industry is starting to invest more space and money in these spaces. According to the International Council of Shopping Centers, food courts brought in $792 per square foot in 2010 and that trend seems to be increasing. However, it is the quality, not the size, of a food court that keeps shoppers around. Consumers spend almost 20% more at a mall with a “good food court” according to a study done by Arun Sharma, a marketing professor for the University of Miami School of Business Administration. A common complaint among shoppers is the “cafeteria-like” feel of food courts and the crowding that may occur within them. A great solution is to move eating areas outdoors, where there is natural lighting and more opportunity for space. Here again retail centers face the obstacle of hot temperatures during summer months. 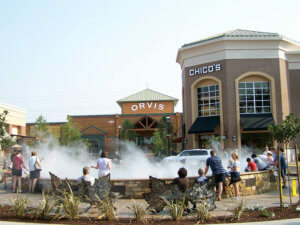 Fortunately, misting systems are also a great solution for retail centers looking to create patio or larger-scale outdoor seating. If customers enjoy their experience enough, they may return back to restaurants even when they are not shopping.